Nine weeks into the NFL’s 2015 season find the Steelers record at 5-4 following a last minute victory against the Oakland Raiders. The Steelers won the game but again lost the services of Ben Roethlisberger, adding drama and intrigue to this week’s match up against historic franchise rival the Cleveland Browns. 1. 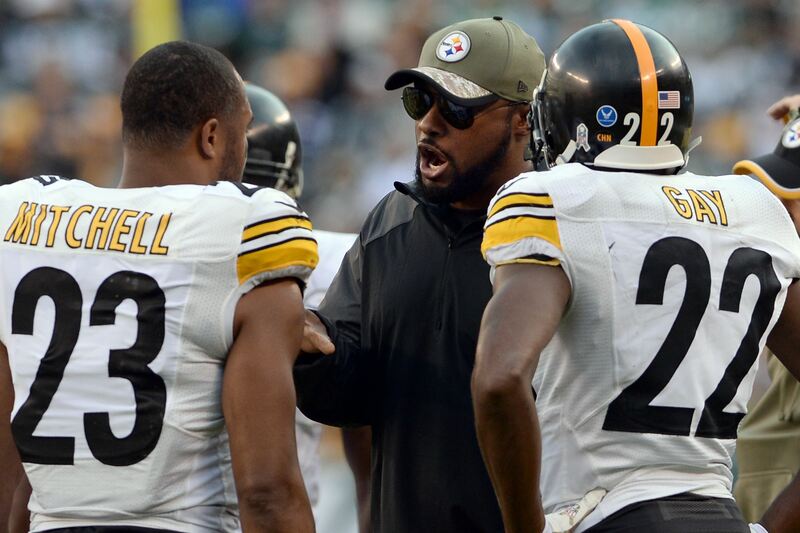 You Are Mike Tomlin: Ben Roethlisberger is out this week, meaning Landry Jones must start. No one knows the status of Michael Vick. If Vick should be unable to suit up and the Steelers need to activate Tyler Murphy whose roster spot do you sacrifice? 2. Last week as we were vigorously debating the justification or lack thereof of Dri Archer’s roster spot, the Steelers cut Dri Archer. Regardless of where you stood in the Archer debate, do you think picking up Jacoby Jones was a wise move? 3. With LeVeon Bell out for the season and Ben Roethlisberger hurt again, do you think the Steelers have sufficient depth at running back behind DeAngelo Williams? Both Joe Starkey of the Tribune Review and Neal Coolong of USA Today Steelers Wire also spoke out in favor of Mitchell. Where do you stand on the issue? What do you think would be necessary for Pittsburgh’s Prodigal son to make a true, definitive home coming and be re-accepted (again) by Steelers Nation? 1. Anybody who is supposedly blocking on the return teams, since they don’t block anyway. Or Sammy Coates. Or DHB. Jones and Vick can’t hit those guys anyway. Just don’t sit anybody whose job it is to tackle people or defend. 2.Yep. Good move. We already knew that Archer didn’t work out. We don’t know that Jacoby Jones won’t pan out. And at least we know he’s figured out how to take it to the house, and how to make Tomlin do the two-step. Jones on the downside still has more upside than Archer. 3. Todman is more than decent as a third string running back. We’re in a better place than we were with Ben F. Tate last year. 4. No, I’m not at all happy with Mitchell’s celebrations. Not that he’s celebrating – that’s fine. But he’s caused a couple of fumbles and has been struttin’ and stylin’ while the ball is on the ground. NO CELEBRATING UNTIL YOU HEAR THE WHISTLE, DUDE! Then, party on, Garth. 5. Terry will probably never make a true homecoming. And, even if he wanted to, it would be difficult because of his Sunday duties on Fox. He’d need to come to Pittsburgh and be on the sidelines for a Monday night game, or he’d need to come to Canton for the next Steeler HOF induction. Or he’d need to come to Pittsburgh to help out a major local charity event. There’s a light in the window and the door is unlocked. But it’s up to him, and I don’t think – for whatever reasons – that’s he’d be comfortable. He’s not coming. 1. Since it’s basically a one-game proposition, I would waive/release somebody who is highly unlikely to be picked up by another team and who won’t cause dead money on the salary cap by being released. I would release Jacoby Jones with a tacit agreement to re-sign him after the Cleveland game. There is no cap hit to doing this (as he was a veteran signed in mid-season) and I don’t think anybody is going to pick him up. Also, Wheaton and AB can do the kick return/punt return duties for one game. 2. I think it was a meh move. He’s past his prime and it’s pretty clear that the issues in the return game are in the blocking. I look at it as a defensive move of sorts – Jones is a veteran who at the very least will not make mistakes in the return game and relieves you of exposing your top-tier players to injury, and who has the ability to break a big return if the blocking ever gets fixed. 3. The depth is as good as one can expect now. Todman isn’t a great option, but he’s the 3rd string back and he’s been with the team all season with all the familiarity that goes with it. It’s a lot better than where we were last season. 4. It’s all part of the package – you take the good with the bad. I don’t have a problem with the celebrations, so long as it’s after the whistle and you’re not getting flagged. Without doing a survey, I suspect his sort of personality is relatively common at that position. 5. Agree with Homer on this. 1. Tough, but I say Chickillo. DHB second choice. Not Sammie, I have high hopes for Sammie and he may be Wheaton’s replacement next year. 2. I’m with Homer. Dri was a bust. Jacoby may still pay off. 3. The short answer is no. The problem is with the salary cap, you never have enough players if your top two positional players go down. The season, already seriously wounded, will be DOA if Deangelo goes down. 4. I like intensity, but he needs to finish the play AND not taunt. I dig celebration, taunting is bush. 5. Thanks for the kudos, Hombre. I really think that ship has sailed. It’s not that Terry can’t be forgiven, but I don’t think he feels the need. The Chief and Emperor Chaz (a nod to Myron) are gone. I don’t think anyone is going to change, the fans or Terry. Yet, imagine an old broken down 78 year old Bradshaw showing up at Heinz for a reunion. THAT would be a tear-jerker. I’m not suggesting he should or will do something like that. Then again, with Brad, you never know. I’m all fine where things are now. No matter what, he did something for Pittsburgh that can’t be repeated. It’s more than enough. I don’t like any of your #1 options. Chickillo is presumably on the team because they were saving him from another team picking him up. DHB has been an important member of special teams, to his very great credit IMO. And certainly not Sammie Coates. He would never clear waivers, and he’s our “Smokin'” Martavis Bryant insurance policy. I don’t actually think it’s an issue, though—Mike Vick is off the injury list. And while I don’t think he could keep us going for long, I feel better about our chances there than I do about how Tyler Murphy would play. He might be great, but I presume there was a reason they were switching him to WR in camp. 1. How about IRing Terrance Garvin? He had knee surgery a few weeks ago, and it’s hard to think he’s going to be back anytime soon anyhow. BTW, did you know the Steelers currently have 15 guys on IR? That’s pretty depressing. 3. We won’t know until we find out whether Todman or Pead are any good. If they aren’t, we definitely don’t. It’s possible we’ll find out Sunday whether we do or not. 4. I can see why people want to put this in the “you’ve got to let players play” category, but I’m not very fond of it. I wish he wouldn’t celebrate another player being down. That really bothers me. It also bothers me that he celebrated while there was a loose ball hanging around. I believe MT had a chat with him and Roosevelt Nix. The play ain’t over until it’s over, and you don’t celebrate injuring someone IMO. Intercept a ball and take it to the end zone, great. Celebrate all you like. Come up with a huge stop on third down forcing the other team to punt, great. But even there you have to think. We’ve seen twice in two weeks where drives were extended by after-the-whistle penalties. 1. I would say someone who they can easily get back and does not cost them any cash. If someone were to poach them it would be no big deal. I am sure there are a few of those guys hanging around but I don’t know enough to name names. Rebecca’s idea sounds good, so does Homer’s. 2. We will not know until Jones get’s a legit shot or two. The blocking last game was abysmal. I read Archer had a bunch a offers to go on practice squads(Steelers included) and he refused all the offers. When you look at his resume not sure if that was a good move on his part. Hope someone gives him another chance. 3. Again, we will not know until we see them. Might as well flip a coin at this point. 4. Sorry Charlie but you have to finish the play. Forced fumbles usually don’t mean much if you do not recover them. Talk trash all you want but don’t hurt your team and don’t give the impression you are celebrating someones injury. His ferocity and fire are feeding this D and they are a bruising bunch. You can catch it but there is a price to be paid and you don’t want MM collecting your toll. 1 – Sacrifice Vick’s spot. Not like anyone else will sign him. 2 – I am not sure what Jones brings to the table. It seems odd for the FO to be banking on his past performances to fuel his future with the Steelers. 3 – They did sign another player. That’s about all they can do. Now the team has to hope Williams stays healthy. 4 – I’m not a fan of Mitchell nor a detractor really. I find nothing special in his game. I wouldn’t even object to his celebrations…so long as he waited for the play to actually be over before he goes off. 5 – For the fans to get over themselves. 2. In deference to Mrs. Rollett I will tone down my answer. HECK NO! And then add on a few more choice cuss words! I actually like Jacoby but cutting DA and signing Jacoby made absolutely no sense. was a good student of the game and whether he was a good learner. If they decided he was still weak on technique and totally a one-trick pony, then…….